After daaaaays of not being motivated, I found a box of fabric that "kicked me in the seat of my pants" and got me creating again. I remember watching my grandmother "paint" with a needle and thread. Actual beautiful thread paintings that she framed. That's where my love of fibers came from. This cuff is a result of that memory. The other side of the cuff has three beaded dangles and a few other beads tucked here and there for added sparkle. 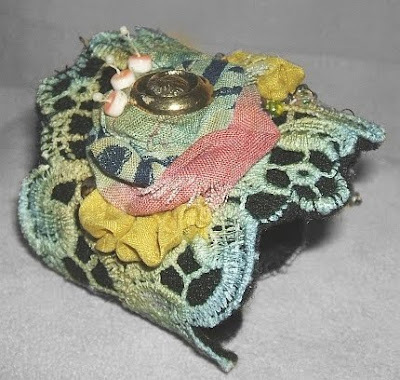 Click Here to see other views of this cuff.